We hand make all our scented candles in small batches using natural soyabean (vegetable) wax, cotton wicks and the finest fragrances that are vegan friendly as well as paraben and phthalate free. These raw materials work together to give our pretty candles a cleaner burn (no soot here! ), fabulous scent throw and impressive burn time. As for our scents, only the gorgeous ones will do - from fresh and clean fragrances to bakery scented candles, traditional, floral and everything in between - we've a scent for everyone. And because everyone has a favourite cocktail we created a range of cocktail scented candles including Frozen Margarita, Gin & Tonic, Cosmopolitan and Prosecco making them perfect gift ideas! 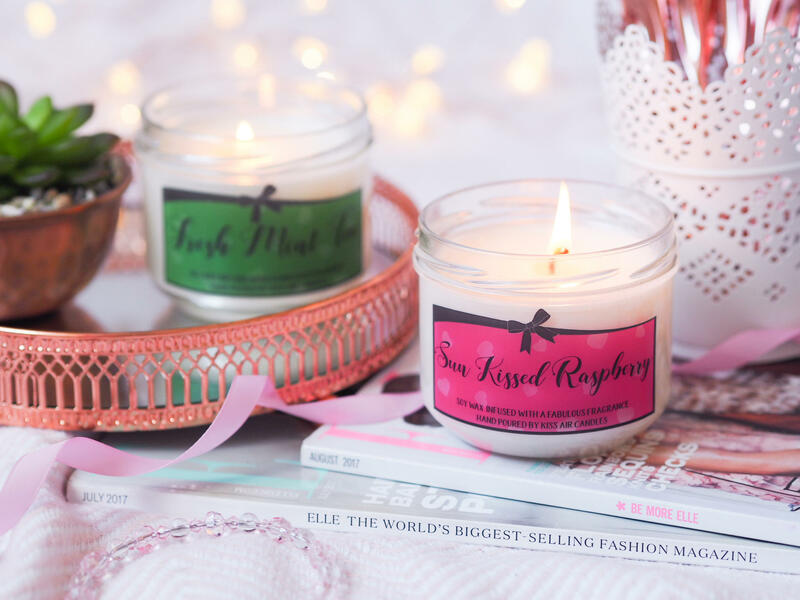 Kiss Air Candles soy wax candles are strong candles because we've highly fragranced each one from top to bottom to make sure that everytime you light it you get a fabulous scent and one you can smell even when you’re sitting over the other side of the room! So yes, these really are candles that smell when burning! We’ve put plenty of thought into the look of each Kiss Air candle range, wanting something that always screamed modern and fun yet cute and pretty regardless of what item you're buying. You’ll find our everyday jar candles have a vivid pop of colour, the cutest writing and are finished with our signature bow which makes our pretty candles the perfect addition to any room in any home.